For those who plan to buy Japanese imported vehicles, here is a quick read. In January 2012, I went to the auto bazaar at Jamhuri Park. I saw the attached car being sold for Kshs. 2.4 million. 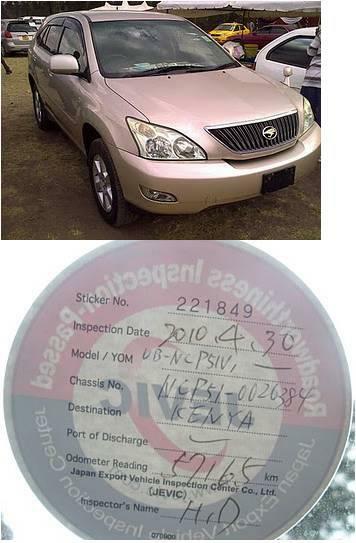 It is a 2005 Toyota Harrier MCU35. The vehicle was very clean. The mileage on the odometer was just under 40,000 km. I then did what I think any person about to invest in a car should do: I noted the chassis number and JEVIC sticker number and went to check on the details of the car. Imagine my surprise to find that the car, as clean as it looked, was not a 40,000 km car at all but was actually a 176,000km car (as at the time it was shipped from Japan). The car had arrived here and it’s odometer had been tampered with. (The check can be done on the JEVIC website if you have the vehicle VIN/chassis number and inspection sticker number, both of which should be displayed on the JEVIC sticker which is normally on the left hand side of the windscreen for all ex-UK and ex-Japan cars – see example of sticker from a different vehicle below; you can put in the details and see a copy of the JEVIC certificate for the vehicle). Now I say “imagine my surprise” but the truth is, I was not surprised at all. I expected the car mileage to be doctored. This is because the vast majority of newly imported cars sold in this market are doctored. If I were to guess I would say something like 80-90%. As a vehicle importer (who for the record has never and will never change a mileage on any car I import), this phenomenon greatly disturbs and angers me. It distorts the market and it gives all vehicle importers a bad name (including the few who do not engage in this practice). However today, I am focused more on the car buyer point of view. As a car buyer (or a buyer of any item at all), it would offend me to feel that somebody was trying to cheat me. However most car buyers in Kenya are very blase about this form of getting conned that occurs everyday. We have now reached a situation where many car buyers automatically go looking for cars expecting that the mileage has been “adjusted” (Yes! That is the euphemism I have heard used most…so innocent and nice sounding) – yet confusingly insist on buying cars that are “low mileage”. It is usually very simple to do due diligence on any car from UK or Japan. You can simply ask to see a copy of the JEVIC certificate. As most cars are tampered with locally, the JEVIC certificate should have the actual mileage at the time of export. You can also take the chassis/VIN number and the JEVIC sticker number and check online. Usually when mileage is tampered, the mileage section on the sticker is rubbed out and sometimes it fades with time. But the sticker number (typed) never fades. Thus even if the mileage part has faded/been rubbed off, it is fairly simple to check sticker number, check VIN number and do the online check. Taking, the example of the Harrier above, I estimate the car came in for about 1.7 – 1.9 million. It is being sold for 2.4 million. A genuine 40,000 km Harrier in the same colour, at the same time would probably be here for 2 – 2.1 million. You do the math. – I may be a pragmatic deal-maker (which I believe most of us fancy ourselves as) and use that information as a bargaining chip to get a better deal. Either way, I see no downside to having the true car information.